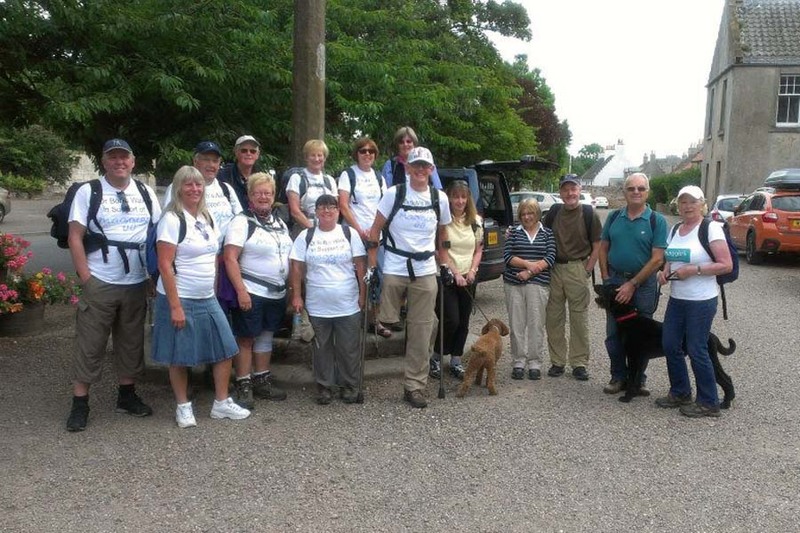 Day 6 – Thursday 8th August 2013 – Crail to Boarhills. Clear skies and the sound of silence. 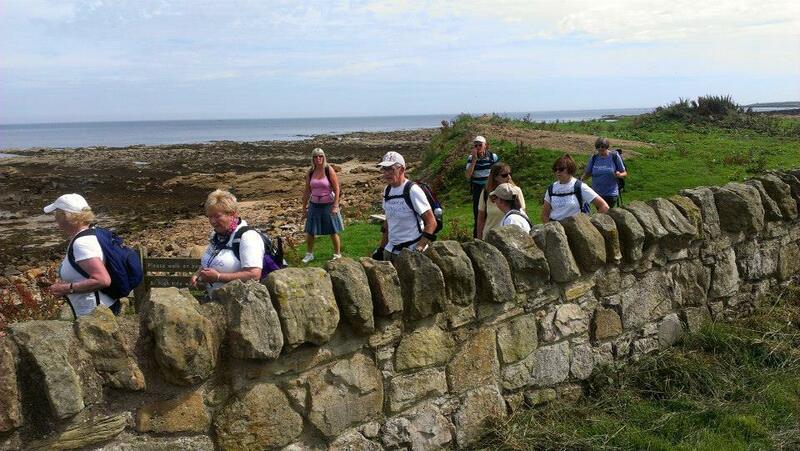 A fabulous journey from Crail to Boarhills, deep in the Fife countryside. There were moments on the coastal path today when all you could hear was silence. No cars, no machinery, not even wildlife. Just the lapping of the waves as they broke on the black, jutting rocks that pock-mark the coastline of north-east Fife. With the sun rising high into perfect blue skies an temperatures nudging 22 then 23, it was simply blissful. Once again we were fortunate – privileged – to see the coastal path at its most enchanting. Day six took us from Crail to Boarhills, a journey of just over ten miles; a shorter distance than previous days, but over more challenging and rugged terrain which took their toll on such a hot day. 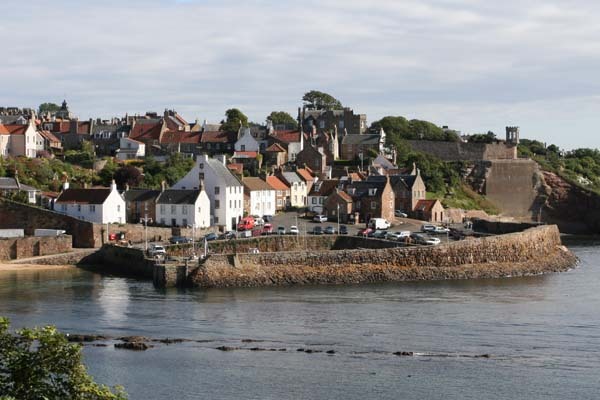 Once again we were joined by new faces and old friends as we headed further round the Kingdom, quickly leaving Crail behind en route to Fife Ness. The sun was just beginning to break through as we joined the path out of Crail, getting used to the narrow walking surface nestled between arable farmland on one side, and the rocks and grass leading to the beach on the other. As we rounded Fife Ness the backdrop started to change. The Fife coastline was replaced by our first views over into Angus – another marker to underline just how far we have travelled since Saturday. We paused on the jarring rocks and boulders for a welcome breather after clocking a brisk two miles on the path. The terrain here can be rugged and difficult, so it was with some relief we saw it had recently been cut back – indeed coastal path staff were out and about working with strimmers as we passed. A quick hop over the stone wall took us from the rugged path to the manicured greens and fairways of the golf course, and a swarm of corn lice – the black beasties attracted to our white t-shirts. Slightly bigger animals lay in wait further down the track – coos! With the path following farmland, it was inevitable we’d encounter a herd after passing through more gates, but ones with young calves are best admired from a distance. Unfortunately the beasts moved to the beach just as we did, so we were happy to take a step back and let them settle before clambering down the rocks and back on to the sands. A fair chunk of the walk was spent on the beach – we had a fabulous beach lunch at Kingsbarns, and were sorely tempted to kick off our boots and go for a paddle. Walking so close to the sea kept us cool, and the pace dropped as we let our canine companions, Fred and Amber, race in and out of the water before racing off ahead of us. It was also a great opportunity to chat to many visitors about our walk and Maggie’s Fife – many people were certainly keen to find out more. Back on the narrow path we zig-zagged up and down, through tall wild grasses, around boulders, and picked our way across the many layers of rocks which brought us back to the sea. And then we turned away from the beach and through a lush tunnel of trees and green foliage , over a metal bridge and up a lane filled with apple trees just not ripe enough to pick from! 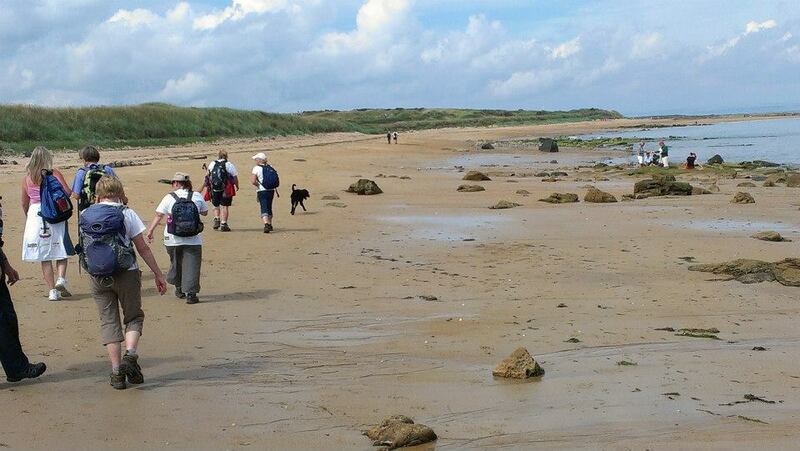 We ended by walking through farmland to our pick-up point – a fabulous day of walking in perfect conditions. We return to the coastal path for a nine-mile hike into St Andrews and on to Guardbridge – a shorter distance again, but with much more challenging conditions to face. Lunch is at the West Sands in St Andrews, and our final destination late afternoon is the Guardbridge Hotel.